I’ve been using this lock for a few years now and I’m quite pleased with it. It is still on its original set of batteries (four AA), and is well built and reliable. My impression has been that this lock is more secure than your average front door lock, but none of this technology is foolproof, nor is a fortified front door going to prevent unlawful entry. If someone is determined enough they can always break a window or just saw through a wall. 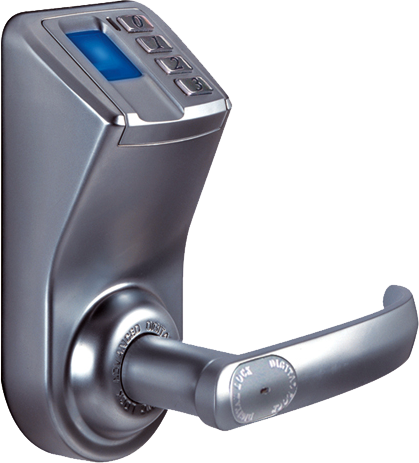 What this lock is about is convenience and the impression that you take your security seriously. I no longer carry keys. I have everything biometric, and the experience has felt very freeing. No more wondering if you remembered if you locked the door, the door is locked all the time. This can be overridden by scanning your fingerprint and typing in a sequence, at which point the light will blink green and the lock will be unlocked in passage mode until such a point as someone pushes a button, at which time it will resume being always locked. This can be handy if you have guests and don’t want them getting locked out. Another advantage is that you can put in a code for a guest and then change it at a future date, thus removing the concern of your cat sitter having the keys to your home. The fingerprint scanner is moderately reliable. If your hands are really wet or dry, it may not register until you remedy the condition, and it takes about a second and a half to read your print. The unit can hold 120 fingerprints, and can also be unlocked via a combination you set on the keypad. What if the batteries die? The unit comes with two keys, which look very hard to counterfeit, and there are two little contacts at the base of the unit. Simply touch a 9 volt battery to the contacts and it will power the unit. I know this isn’t a motion light, but it appeals to the same desire: that security should be something that makes your life easier, rather than something that just gets in your way while protecting you from hypotheticals; it should light your way or free you from the need to worry about keys. I’ve had quite a few guests look jealous and ask me where they can get one. You won’t likely find this lock in a local hardware store, but you can have it conveniently delivered from amazon . I got mine from Brickhouse Security. They have all sorts of high tech security stuff like this, and still carried this lock last I checked.